Eye patches, not to be confused with sleep masks, are a piece of material designed to fully block the vision out of a single eye. When is an eye patch needed? A majority of people who wear eye patches are children. 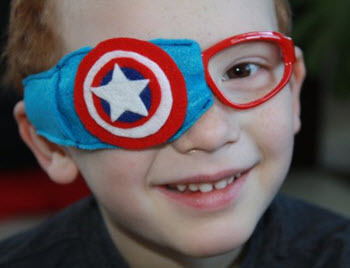 This is because while eye patches can be used to help deal with many eye issues, they are most commonly used to alleviate or correct the symptoms of amblyopia, otherwise known as lazy eye which can usually only be adequately dealt with during childhood. Amblyopia is when the brain receives a different or inferior signal from one eye, so it ignores this message, instead focusing on the one from the superior eye. This means that the sight out of one eye will be blurrier than the other and as the child grows, the weaker eye will not develop. As the child gets older, the vision in that eye will get worse, and the problem will be harder to deal with. The child will be asked to wear the eye patch for a set time per day to strengthen the eye. A good analogy is to think of muscles – if a muscle is weak, then you do exercise and by using the muscle it can get stronger. An eye patch blocks the vision out of the strong eye, forcing the weaker eye to work and focus. Like with exercise, you may not see an immediate improvement, but after time it will make a difference. It is important that the child wears the patch while awake. If the child is sleeping they are not using either of their eyes to see, so putting the patch on then will not achieve anything. What types of eye patches are there? There are two main types of patches – disposable and reusable. The disposable kind are usually mass-produced by a supplier and consist of a piece of synthetic material with adhesive on the back so that they can stick onto the area around the eye. They are usually quite hassle-free as sticking them on is quite easy and similar to using a plaster, and because they are disposable, there are few hygiene issues. Some children with sensitive skin may have a reaction to the adhesive on the back. 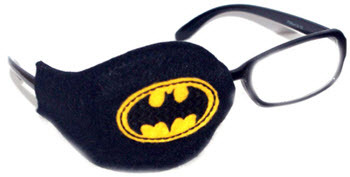 The re-usable kind are mostly made of fabric and can be attached onto or under a pair of glasses. They are often quite easy to keep clean, and you will probably only ever need one. They are ideal for sensitive skin, but putting them on can sometimes be tricky, and you should keep your strong eye on the threading around the edges in case it gets caught on the glasses. Eye patches are not a standard product, so the easiest way to source them is usually through the internet as few physical locations stock them. The disposable ones can be found through specialist sites, but also through larger retailers such as Amazon. If you search for eye patches, though, it is advisable to add the word ‘orthoptic’ into your search. Otherwise, most of the results will be sleep masks. Many small independent businesses make the re-usable ones especially for kids, and usually offer greater product choice and detail than available through the larger retailers.